In Catania the local Community of Sant'Egidio has promoted the initiative "Pray for Paris, pray for the world". 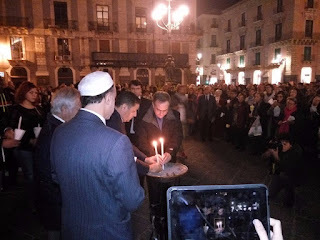 At University Square, after praying for peace, each believer according to his/her religious tradition, in the church and in the mosque, Christians and Muslims came together to enlight the candles of hope, the lights of the civilization of living together. Because peace is the name of God! Because only peace is holy!